This time of year it’s not always easy to travel long distances. 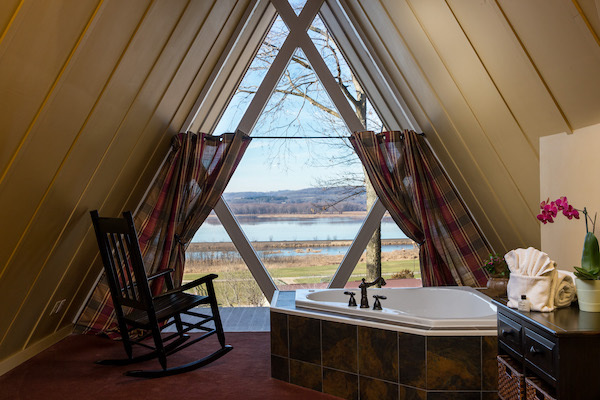 Staycations and short road trips are often the best way to get away with little or no hassle. We visited Galena as guests of the Goldmoor Inn and Visit Galena and were not otherwise financially compensated. We provide our reviews based on our personal experiences during our visits. One of the spots we like to visit in the Chicagoland area is Galena, Illinois. In just under three hours you can find yourself in a charming small town that is perfect for relaxing, shopping, leisure activities and, of course, eating. When you arrive in downtown Galena it’s hard to believe that this sleepy little town once rivaled the population of Chicago in the early 1800s. It was home to the first big mining “rush” in the U.S. when settlers arrived ready to make their fortunes. You won’t need to be there long to learn that General Ulysses S. Grant made his home in Galena. 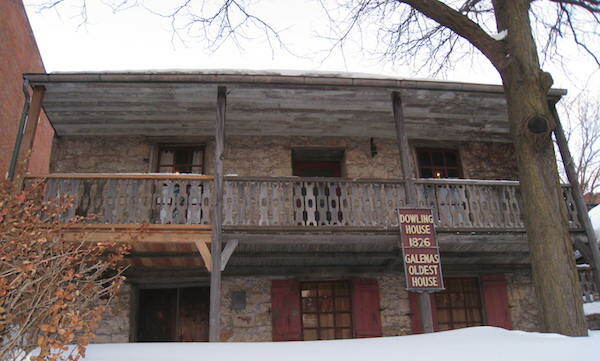 Visit the Galena & U.S. Grant Museum to read all about Grant’s time in Galena. Full of history and artifacts this spot will provide a good place to start. There are plenty of historic homes and buildings to tour and enjoy. 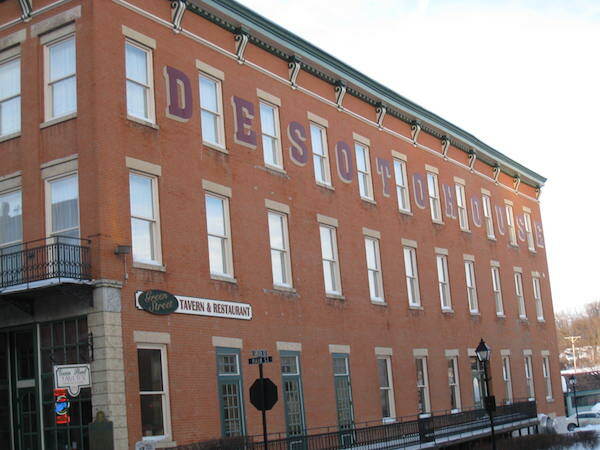 Included has to be the Ulysses S. Grant Home and the DeSoto House Hotel, which was even used as his campaign headquarters in 1868. One of the things we like best about Galena is that although it is loaded with history the community is welcoming to all who come and visit. No matter where you’re from or what your stripes are you will feel right at home. The downtown strip is only a half-mile long but you will be surprised to learn that there are more than a hundred shops ready for you to explore. From delicious fine chocolates to vintage clothing there really is something for everyone. The good news is that getting around is super easy. Just park at one end and walk leisurely down Main Street exploring. This Main Street is full of so many different types of stores. We were able to find some lovely English teas, locally made honey and warm cozy socks. We had a ball.Here’s a look into a few of our favorites. 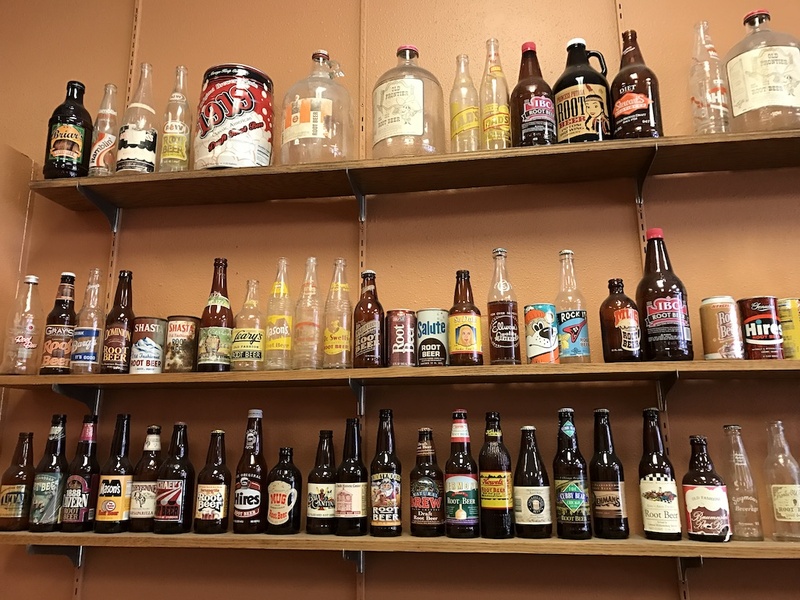 One of the unique stores on Main Street is Root Beer Revelry. Yes, a store completed devoted to root beer. It just so happens that Diana loves root beer so she was like a kid in, well, a root beer store! To make things, even more fun you can get a float at the ice cream float bar with any soda in the shop (spoiler they also have some other specialty flavors like orange, key lime, and black cherry). You can even customize a six-pack of bottles to go, which is really special for your favorite root beer lover. Pro Tip: just be sure not to leave them in the car in the cold weather. They might pop their caps and make quite a root beer mess. Don’t ask how we know this. If you’re like us you love to taste test before you buy goodies to bring home for yourself or your friends and family. You’re in luck when you stop at the Galena Garlic Company. Whether you’re sampling the olive oils, vinegars or spice mixes they have you covered. 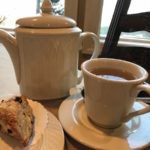 Another place for tasting and shopping for food lovers is the Galena Canning Company. 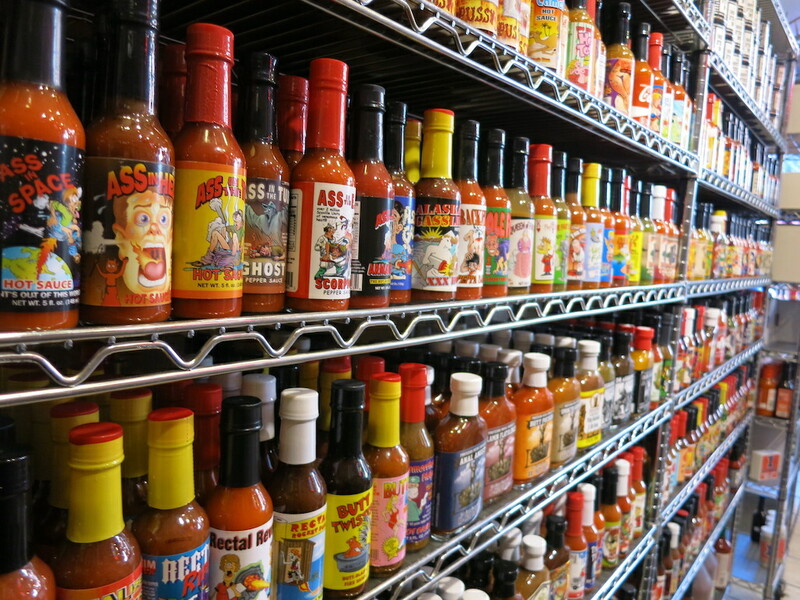 While they have a selection of sauces, spreads, marinades and more you simply cannot miss their legendary huge collection of hot sauces. Over 300 varieties will make your head spin. Just looking at all the bottles and the interesting names will keep you busy for quite a while. 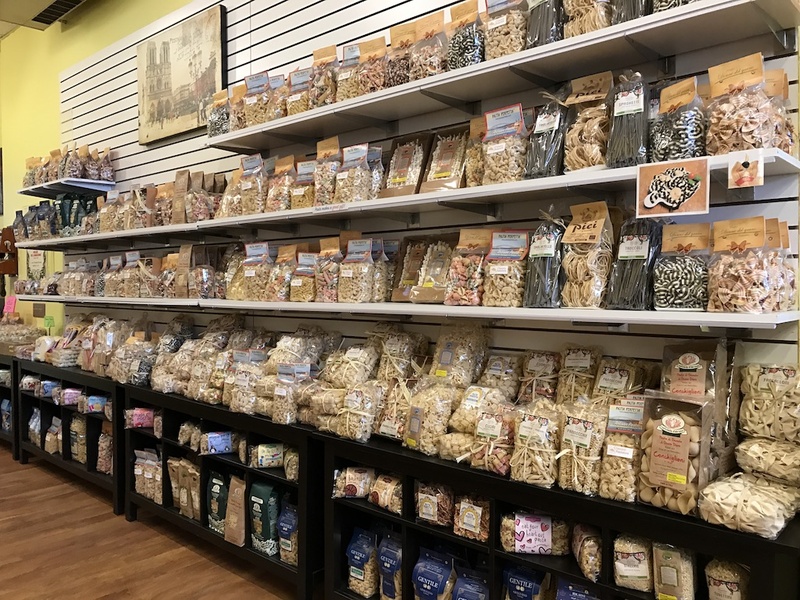 Pasta lovers will find it difficult to choose which pasta to take home at Pasta Perfetta. While you’ll find many Italian style pastas don’t be surprised when you spy German spaetzle, too! Pasta in every shape, flavor and style that you can imagine. I love socks. I mean I really love socks. If you know me at all you know I have a kind of obsession with socks. Especially compression socks, but that literally is another article. One of the stores on Main Street in Galena is For Bare Feet. It has nothing but socks. 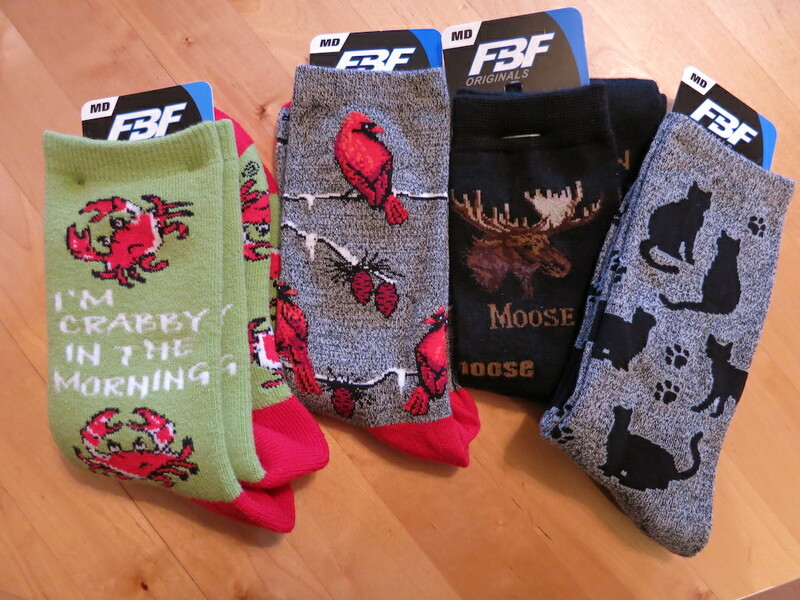 I absolutely spent too much time in here and came out with some new socks for my never-ending collection. No matter your passion I’m sure they have a pair of socks just right for you. 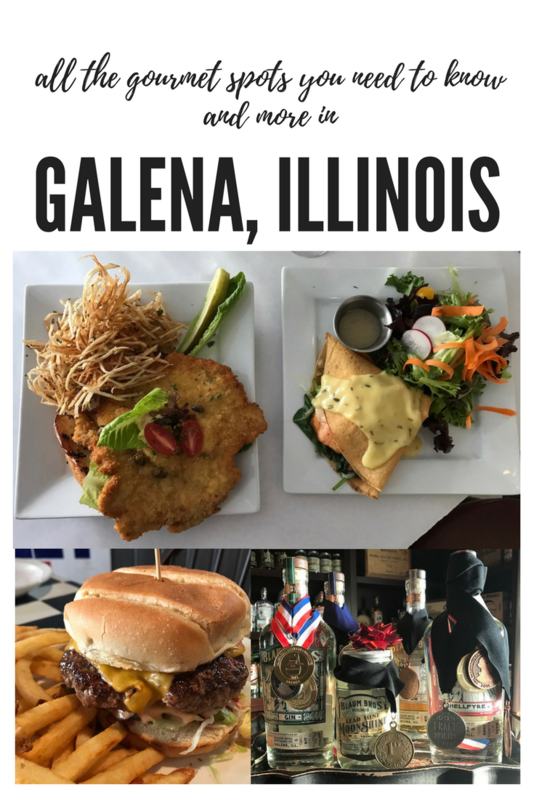 From quick bites to fine dining Galena is full of eating possibilities. 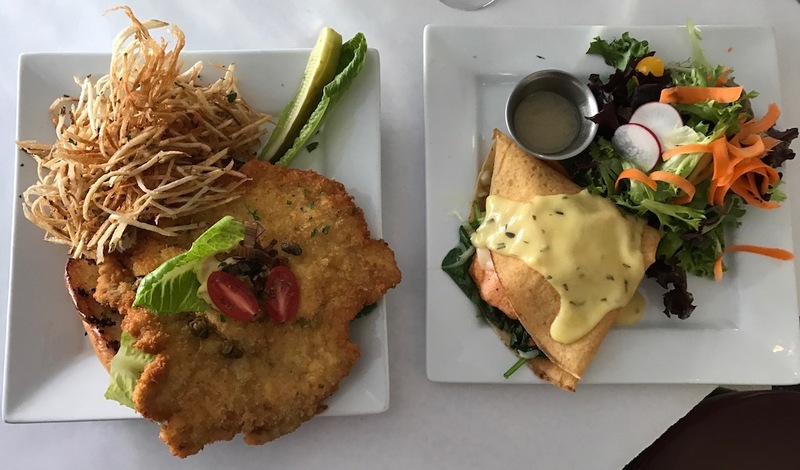 One of our favorite spots was Fritz and Frites a self-described French & German bistro in Galena. Since these are two cuisines we love we had to try it. This is a wonderful spot for a quiet and civilized lunch. They have a very good wine and beer list to get you started along with a delicious pate Maison. 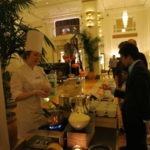 We also really enjoyed the classically prepared Wiener Schnitzel and the light and lovely salmon crepe. Wherever we go we seem to find great cheeseburgers and Galena was no exception. We stopped in Durty Gurt’s Burger Joynt for what they say is the “best burger in town.” Who are we to disagree? We went with the basic cheeseburger, a half pound of Angus Beef grilled perfectly. Meaning it was juicy and flavorful. 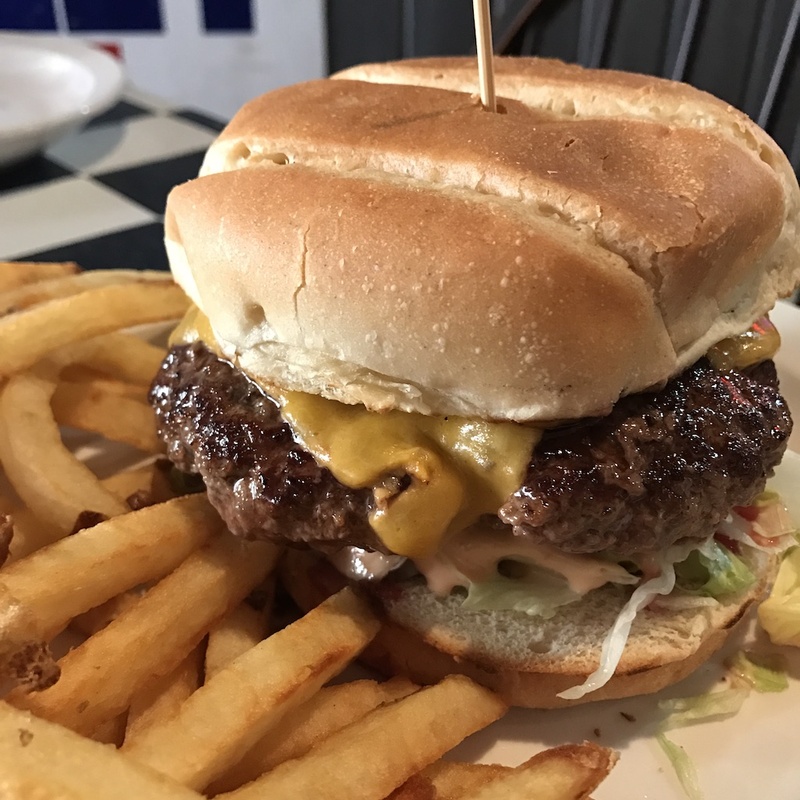 A toasted bun is the perfect home for the burger topped with melted cheddar cheese, shredded lettuce, tomato, red onion, dill pickles and their own homemade mayo. We had to try their onion rings too. If you’re a fan don’t miss them. They also have a full line of other sandwiches, ribs and seafood too. 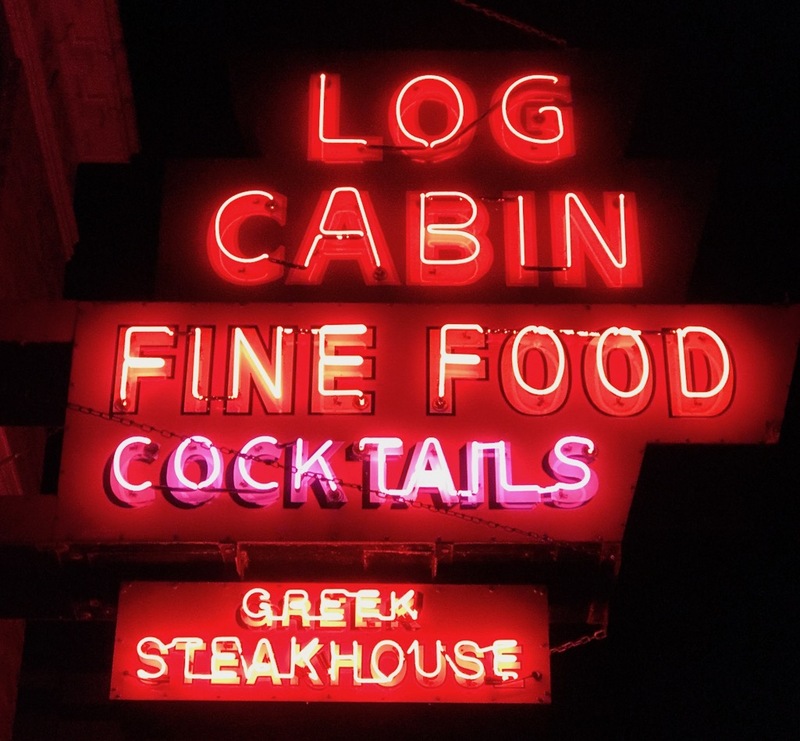 And don’t skip Galena’s oldest restaurant the Log Cabin Steakhouse. You can’t miss their distinctive neon sign that shines brightly on Main Street. The sign alone makes me want to stop in. 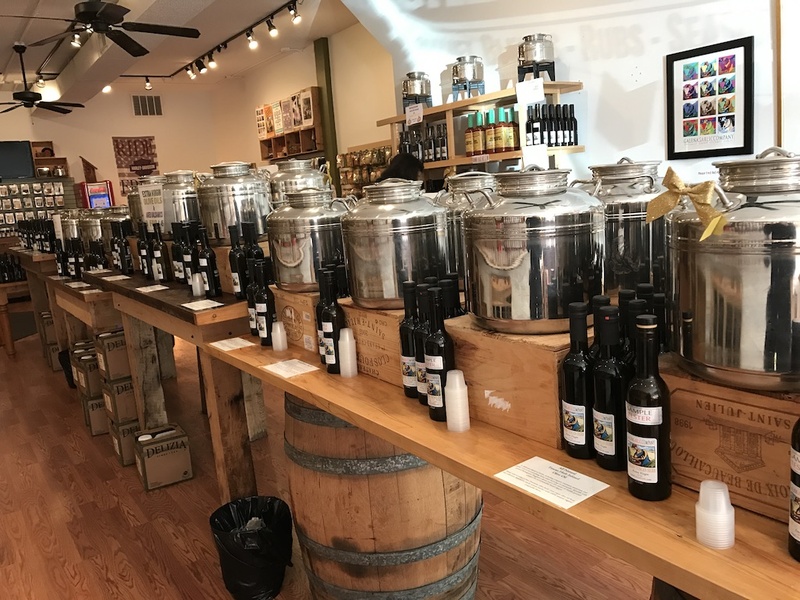 Run by the Rigopoulos family who imports their favorite olive oil and other Greek specialty food items. We had dinner there one night and we can vouch for their “famous” Greek Chicken. Authentic, delicious and plentiful! Every meal comes with the classic “relish dish,” coleslaw or salad, choice of potato and bread and butter. Their menu is full of traditional supper club entrees – lots of steaks, chops and seafood. There’s a piano bar on the weekends. Who doesn’t love that? Pro Tip: Order a cocktail. They know how to make a great steakhouse drink. Strong. When you’re wandering around enjoying the town you’re bound to get a little thirsty, right? Don’t worry, there are plenty of watering holes to quench your thirst. One spot would make for a great meeting place for those that might get a little tired of shopping. The V.F.W Club is just what you’d expect. A bar. Cheap drinks and beer make this a great place to meet and get to know the locals. 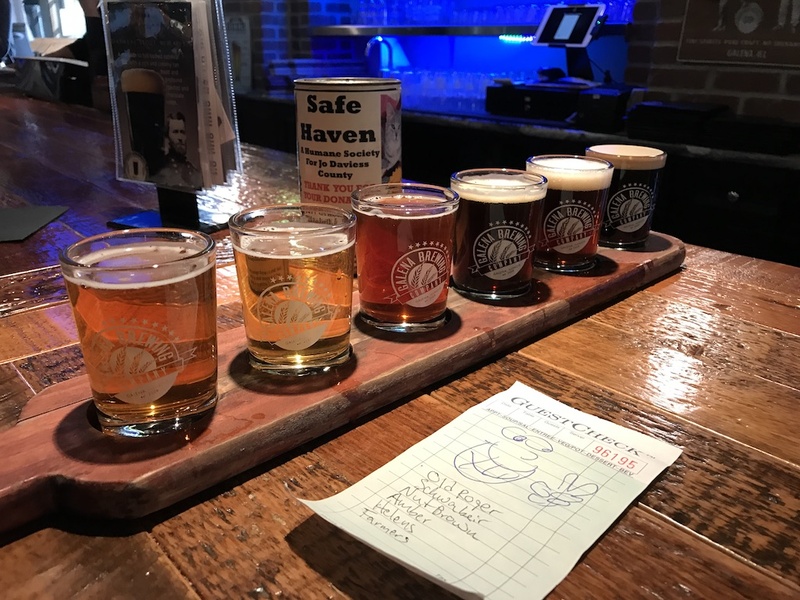 You don’t need to go out of town to sample some of the hometown brews. Galena Brewing Company is right on Main Street. Beer lovers will love all the choices they have. We tried a sampler and both found several that we really liked. The Farmer’s Blonde Ale and several of the seasonal brews really got our attention. While you’re there you can sit, relax, sip your beer and get some good eats too. We liked their Italian Beef that’s made like the popular Chicago sandwich and delicious. 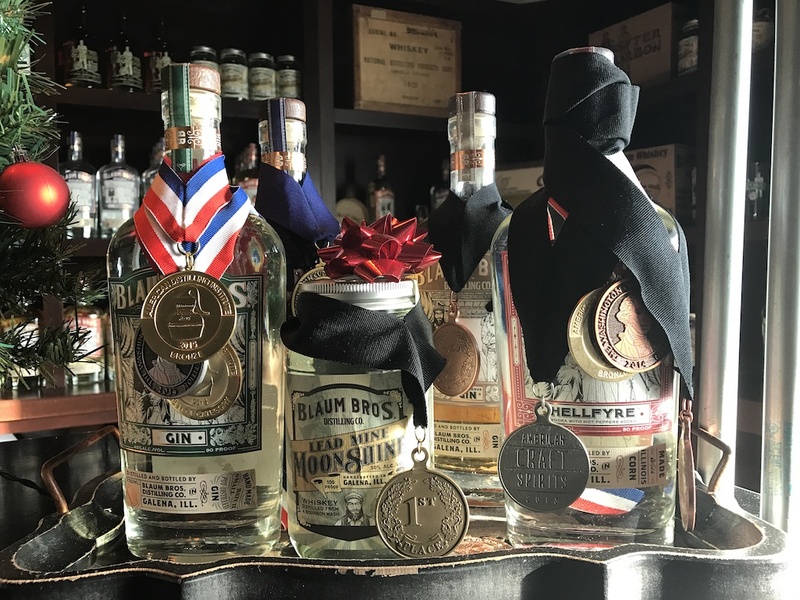 If spirits are more your thing be sure to stop in Blaum Bros. Distilling Company. Located on the way into town you can take a tour and do a little sampling. They create bourbon, gin, vodka, and moonshine! There’s a comfortable tasting bar to explore their products in a relaxing atmosphere. 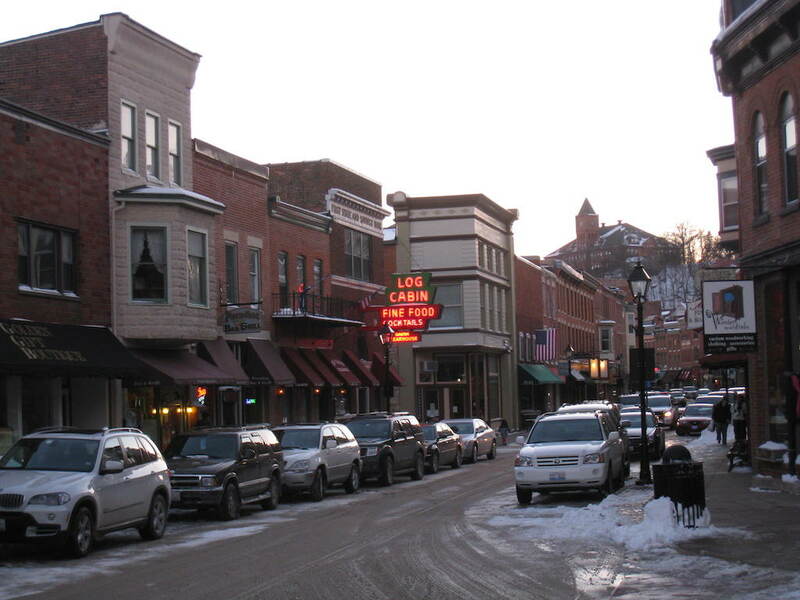 There are many types of accommodations to choose from for your stay in Galena. 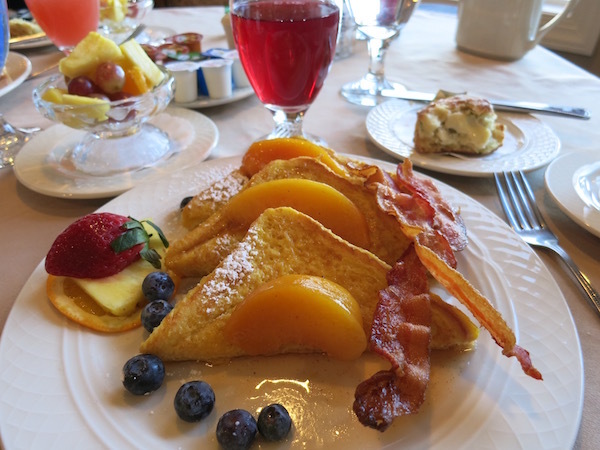 From lovely bed and breakfasts, historic hotels and full-service resorts. 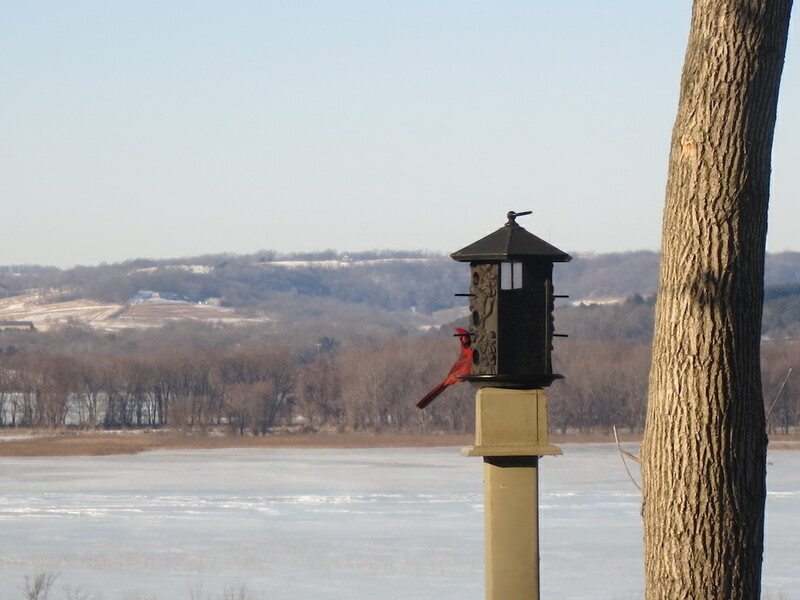 We were fortunate to stay at the lovely Goldmoor Inn located right along the Mississippi River and it is simply one of the most relaxing and lovely places we’ve been. 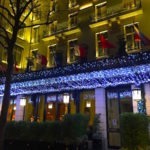 Not only do they have luxurious suites but the restaurant serves up such wonderful food you may have a hard time leaving. Even to take the 10-minute drive into downtown Galena. For other suggestions on where to stay check out the selection at VisitGalena.org. 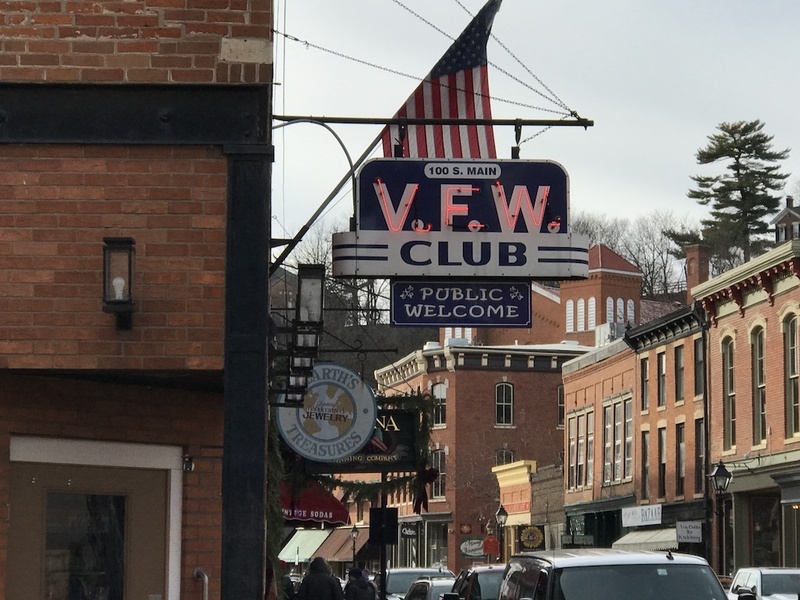 One of the really attractive things about Galena is that, although it’s a terrific wintertime road trip, it’s a great place to visit any time of year. While the winter has great outdoor activities at the nearby ski resorts, the warmer weather brings hiking, birding and even hot air ballooning. For more information be sure to visit VisitGalena.org for all the details. 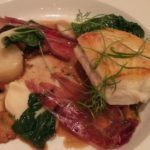 Pin it for your next food travel adventure to Galena, Illinois.